Sarah Wozny, DPT, CSCS, graduated from Saint Louis University in 2006 with a M.S. in physical therapy and completed her doctorate of physical therapy in 2007. Her clinical experience includes, orthopedics, sports medicine, and manual physical therapy. She also has experience as a personal trainer and utilizes her knowledge of injury prevention and biomechanics to create & continuously maintain various programs for clients of all fitness levels and needs. She is in private practice and the owner of a physical therapy clinic in Racine, WI. The purpose of this case study was to illustrate the effects of combining pulsetile lavage and vacuum assisted closure dressing for the treatment of a surgical wound infection. Case Description: The patient was an 81 year old male who underwent abdominal surgery which became infected. The patient was sent to physical therapy for wound care for pulse lavage and sharp debridement prior to application of vacuum assisted closure, three times a week. Outcome: Measurements were taken during the initial evaluation and once a week during the treatment period. The wound displayed dramatic results in percent of total wound area closure and decreased necrotic tissue as a result of the combination of all three forms of debridement. Discussion: The physical therapy plan of care assisted wound closure in a shorter period of time when compared to normative wound healing timeframes. A combination of different forms of debridement provided a clean, moist, and sterile environment to enhance new granulated tissue formation, allowing full wound closure. The art of wound care is a trial and error science. There are over 3000 different wound care products on the market that may be utilized to treat patients. One of the forms of assisting wound closure is the vacuum assistive closure device (VAC). The VAC consisted of a piece of foam placed directly over and in the wound. Transparent tape is placed over the area surrounding the wound to secure the foam and aids with draining the wound to keep the area clean and sterile. Attached to the foam is a tube which removes the drainage from the wound bed. The tube is connected to a vacuum source which pulls the drainage from the wound into a disposable canister. The purpose of the machine is to drain the excess fluid from the wound that may hinder the healing process. Another common treatment option for wound care is pulsetile lavage. This form of mechanical debridement uses intermittent and pulsed jets of saline solution into the wound bed and simultaneously suctions the debris from the wound. The process helps loosen the debris from within the wound bed, reduce bacteria, and has the ability to irrigate tunneling and undermining, common with many wounds. Pulsetile lavage is a more specific form of debridement when compared to whirlpool due to its ability to concentrate on a small area with the suction tube. The common factor with all wound care is a mixture of different forms of debridement, ointments, and dressings. Finding this effective combination can prove to be difficult, but by trial and error, a treatment plan can be created with successful outcomes. This case report describes the combination of different forms of wound care options as treatment for a surgically infected abdominal wound. The following data describes the effectiveness of combining pulsetile lavage, VAC, and sharp debridement as the primary treatment plan. The patient selected for the study presented to the hospital’s in-patient wound care clinic with a large infected abdominal wound from a surgical procedure two weeks prior. The patient was an 81 year old male who was retired and lived alone at home. He was admitted to the hospital for transitional cell carcinoma. The patient underwent a radical nephrourecterectomy, cystectomy, prostatectomy, and urinary diversion surgery by way of abdominal entrance. Post surgery, the wound became infected with bacteria and opened with necrotic tissue present. The patient’s past medical history consisted of congestive heart failure, myocardial infarct, cardiac artery disease, cardiac artery bypass graft surgery, renal failure, change in mental status, cancer of the bladder, hypertension, diabetes mellitus, hypercholestrecolemit, peripheral vascular disease, and sepsis. The patient was at risk for falling due to pervious falls and his need for an assistive device. The patient presented to the department as alert and had good awareness to safety. He was independent at home with all functional activities of daily living (ADLs) prior to hospital admission. He required the use of a cane when ambulating short distances in and around his home and used a wheelchair for long distances. Three weeks after the surgery, an order was written by the patient’s surgeon to send the patient to the physical therapy department on Monday, Wednesday, and Friday for pulse lavage to abdominal wound before the Vacuum Assistive Device (VAC) dressing change. Prior to participating in the study, the patient signed an informed consent form approved by the hospital. 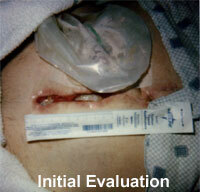 The form allowed the author to take photographs of the wound and access to all chart information. No identifying information was allowed outside the hospital. The initial evaluation took place in the physical therapy wound care clinic. The evaluation consisted of a chart review, wound inspection, measurements, wound description, determining short and long term goals, developing the plan of care, and patient education. The site of the wound was midline of the body in the middle abdominal area. The wound was considered full by the depth. Wound size measured to be a width of 2.7cm, length 11.5cm, and depth 2.7cm. While inspecting the edges within the wound, tunneling was found at 12:00, most proximal, going 5.2cm superior. Necrotic tissue within the wound bed was approximately 25% of the entire wound surface. There was erythema noted around the wound surface. No odor was present. Drainage was minimal, consisting of blood. The infection was bactermia. Short and long term goals were then decided. Short term goals were to be accomplished by 2-4 weeks. These consisted of decreasing the size of the wound by 25%, decreasing the amount of necrotic tissue by 50%, and preparing the patient for possible surgical intervention for closure of the wound. Long term goals were to be met within 6-8 weeks. These consisted of decreasing the size of the wound by greater than 50% and decreasing amount of necrotic tissue by 100%. Plan of care was determined, with physical therapy three times a week; Monday, Wednesday, and Friday and to provide patient and family education. Interventions included pulsetile lavage with 2000ml of saline solution, sharp debridement with scissors and forceps as needed, and redressing of VAC dressing by the endointestinal nurse. The typical treatment session consisted of the patient arriving to the wound care department on a stretcher by the hospital’s transportation department. A review of the patient’s chart was conducted to insure no new changes in the patient’s status which would contraindicate physical therapy. The patient was taken back into the treatment area. First, the VAC machine was turned to off and the dressing would be removed. Once all dressings were removed, inspection of the wound took place to note any changes/improvements. The therapist performed pulse lavage to all areas of the wound bed and tunneling with 2000ml of saline solution. Sharp debridement of the necrotic tissue from the base of the wound bed was performed, as needed, with scissors and forceps. The wound was then redressed with the VAC dressings by the endointestinal nurse. The patient returned to his room on the stretcher via hospital transportation. Measurements of the wound were taken once a week and the change in total percent of wound closure and total percent of decreased necrotic tissue is illustrated on the graph. After week one of treatment, the wound measured 10.0 cm in length, 2 cm in width, 2.5 cm in depth, and the tunneling proximal at 12:00 to be 4.3 cm. The amount of necrotic tissue did not show a significant decrease. The patient was reevaluated two weeks later. The chart review contained the same information. New measurements were taken of the wound, width was 1.5 cm, length 9.0 cm, depth 2.3 cm, and the 12:00 tunneling 3.4 cm going proximal. Erythema was still present in the periwound and there was minimum drainage of blood. After two weeks of treatment, the wound had closed 1.2 cm in the width, 2.5 cm of the length, 0.4 cm in depth, and 2.8 cm in the tunneling. The overall closure of the wound equaled 37%, which had met our short term goal of 25% decrease in size of wound. The goal for necrotic tissue was not met at this time. After the third week, the wound was again remeasured. A bridge of new granulation tissue had formed in the center of the wound 3.0 cm long, splitting the wound into two separate areas. The proximal wound measured 3.5 cm in length, 1.2 cm in width, and 2.0 cm in depth. The distal wound measured 1.5 cm in length, 1.0 cm in width, and 1.5 cm in depth. Necrotic tissue had decreased to approximally 10% of total wound area. The following week the patient was discharged from physical therapy wound care secondary to partial closure of wound and no further need for physical therapy care. The VAC will be changed 3 times a week on the floor by the floor nurse for the remainder of his hospital stay until the wound is fully closed. Following the 4 week period of skilled wound care by physical therapy of 3 times a week, the patient’s wound size and necrotic tissue decreased significantly. This case report displayed the course of treatment which produced these results. The outcome suggested a combination of different forms of debridement as treatment options can produce a significant amount of closure in a wound which could take up to 8 months for fully close and heal. 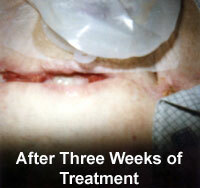 The amount of wound closure and decreased necrotic tissue was a remarkable result for this type of wound and patient. For the majority of wounds to close, the wound must stay clean, moist, and free of excess exudate which can hinder and lengthen the amount of time to heal. The average time for a wound of this nature to close is up to 8 months. The amount of time it took for this wound to heal is significantly faster when compared to the normal timeframe. The increase in healing time can be associated with the combination of cleaning the wound with pulse lavage, debriding the necrotic tissue to allow new tissue to granulate, and keeping the area free of exudate by the VAC. From this report, further research is needed to show the effectiveness of these treatments together. Today, there is little evidence on the effectiveness of the VAC dressing. I believe this method when combined with other forms of debridement and dressings are essential for wound care.